For London, addressing synagogue security means considering 775 families who call Beth Emet their spiritual home, along with the children enrolled in the institution’s pre-K through sixth-grade school. London intends to have active shooter training not just for staff but for congregants as well, she said, although she hasn’t yet scheduled such events. And in her community, she’s not alone. London said her colleagues are taking similar proactive approaches. The Pittsburgh shooting, while unprecedented, wasn’t an isolated anti-Semitic incident. The Anti-Defamation League, a pro-Israel, Jewish non-profit civil rights group, reported a 57 percent increase in U.S. anti-Semitic incidents last year. The ADL recorded 47 anti-Semitic incidents in Illinois in 2017, nearly a five-fold increase from 10 incidents in 2016, said Jessica Gall, ADL Midwest regional director. The state had the 10th-highest number of incidents in the country. Illinois incidents are split almost evenly between vandalism and harassment. The state saw only one instance of anti-Semitic violence between 2012 and 2017. Nationwide, the 2017 numbers mark the second highest since the ADL began tracking incidents in 1979. 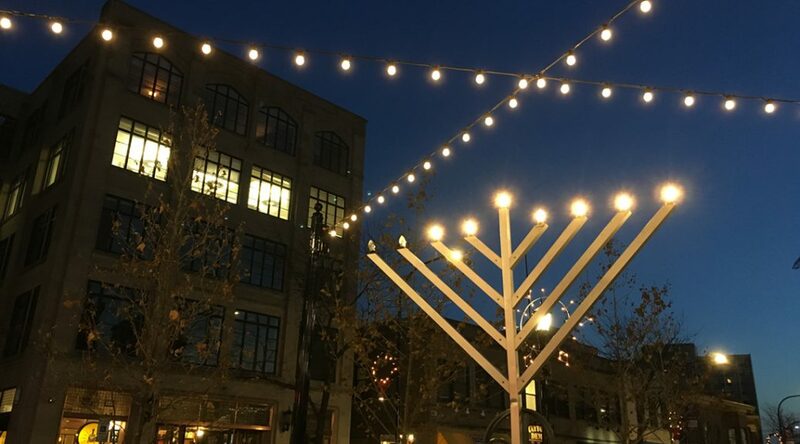 In Illinois, incidents reported to ADL occurred at universities and elementary schools, synagogues and restaurants, and normally peaceful Jewish and non-Jewish neighborhoods. 2017 also brought bomb threats across the country, one of which targeted a Jewish community center in Hyde Park. A different ADL survey from 2015 asked respondents to rate the veracity of 11 negative statements about Jews, such as “Jews are more loyal to Israel than to [this country]” and “Jews have too much power in the business world.” From the results, based on a survey involving 10,000 phone calls, the ADL projected that 220 million people in 19 countries surveyed harbor anti-Semitic beliefs. But reports and data don’t always capture the full extent of American anti-Semitism, said Kelley Szany, director of education at the Illinois Holocaust Museum and Education Center. “No matter if they’re committed against a member of the Jewish community or the Muslim faith or the LGBTQ community, the challenge overall with hate crimes is they’re often not reported to law enforcement,” Szany said. A single cause of anti-Semitism is hard to pinpoint, Gall said, calling it “the $64 million question.” But one element is consistent. Hate crimes have seen a shift in past decades, although anti-Semitism, in particular, going back to Old Testament events, is a 2,000-plus-year-old issue, Szany said. And in Illinois, the trend is obvious. In the early 1970s, neo-Nazis prepared to march in downtown Skokie — an area known historically for its religious Jewish community, where thousands of Holocaust survivors lived. The plans ignited widespread public outrage about the rally and anti-Semitic attitudes, opening a fierce debate about free expression in a conflict that went to the U.S. Supreme Court. The court upheld the right to the rally based on the First Amendment guarantee of freedom of speech but, ultimately, the neo-Nazi group never marched in Skokie, holding the event in Federal Plaza in downtown Chicago instead. But today’s anti-Semitism in the U.S. has a less obvious appearance, bound instead to cryptic harassment, graffiti, and perceived political ties between American Jews and Israel, London said. While the Jewish community doesn’t often face discrimination on the street or by law enforcement, it is the target of conspiracy theories, many of which are based on money and power. “There are groups that want to target Jews because they think that Jews are taking over the world,” London said. Anti-Semitism also isn’t exclusive to the political right, London added, although fewer conflicts arise from the left. But the intentions driving the rise in hate crimes — not just anti-Semitic ones — have commonalities, Gall said. The increase in hate crimes is a crisis that has led religious leaders of all faiths to move beyond “thoughts and prayers” as they search for ways to improve security and combat hate in their communities. Religious institutions, especially places such as synagogues, Jewish community centers and mosques, should consider security capabilities in terms of budget, Gall said. Staff at religious institutions should, at a minimum, have active shooter training, she said. The ADL doesn’t necessarily recommend places of worship have armed guards, she added, addressing calls by some lawmakers, including President Donald Trump, to place armed guards at entrances. The mass shooting at a bar in Thousand Oaks, California, that followed the Pittsburgh event by just nine days, killed 12 people, and could have claimed more fatalities. It didn’t, London said, because many of the people at the site were college students who received active shooter training during high school. Active shooter training aren’t the only safeguards against violence in places of worship. An ADL guide more than 100-pages long titled, “Protecting Your Jewish Institution” details the precautions faith groups should consider, Gall said. The guide recommends immersing security in synagogue culture by establishing procedures for evacuations and lock downs, teaching congregants how to handle suspicious mail, establishing website policies — posting facility addresses and event information might not always be safe — and implementing plans for responding to bomb threats. “These are best practices across the board,” Gall said, adding that the guide applies to non-Jewish religious institutions. Beth Emet has an established relationship with local public safety officials and emergency responders — London said someone from the Evanston Police Department walked the building to determine where weak security points might exist — and the synagogue has cameras on the doors. But as congregations aim to improve physical safeguards, they also should continue strengthening their ties within the community to prevent anti-Semitism and hate from penetrating local religious circles. Bringing people together wherever possible — community centers, churches, mosques, Shabbat dinners are examples — for dialogues among different faiths, backgrounds and perspectives, is, in some respects, a lost art, Szany said. A vigil at Beth Emet the evening after the shooting drew leaders from Jewish, Christian, Muslim and Baha’i faiths along with local politicians, London said. Approximately half the community members who packed the synagogue sanctuary weren’t Jewish. Interfaith leaders came together a week later at a pre-planned ILHMEC event commemorating the 80th anniversary of Kristallnacht, the deadly 1938 incident in which Nazis torched synagogues and vandalized Jewish property. ILHMEC staff altered the program in response to the shooting, inviting representatives from reform synagogue Congregation Solel, the Muslim Community Center, the Japanese American Service Community, the United Methodist Church and the Chicago Archdiocese to discuss shared experiences of oppression, Szany said. Learning how to “agree to disagree” during conversations about anti-Semitism, hatred and discrimination when those topics easily incite emotional responses will allow groups of all faiths to “move forward from there” to stand up for one another, Szany added.